Occasional snaps and thoughts from here and there posted on a random basis with no rhyme and minimal reason. For things less random, check out the travel photo Galleries. To kick off a new year of shooting local jazz in D.C., I couldn't have found myself at a better gig than the Quincy Phillips Quintet at Bohemian Caverns on Friday. The night featured Quincy Phillips on drums, Kris Funn on bass, Janelle Gill on piano, Tim Green on alto saxophone and Quamon Fowler on tenor saxophone and EWI. Check out the new gallery of native Washingtonian and New York resident Marc Cary and his Focus Trio at Bohemian Caverns in December. Cary performed with Tarus Mateen on bass, Brian Settles on saxophone, and Sameer Gupta on drums and tablas. While I had the pleasure of doing some portrait and event work and exhibited my safari photo collection this year, 2012 was unquestionably dominated by live jazz for me. Jazz is ______: What is jazz to you? 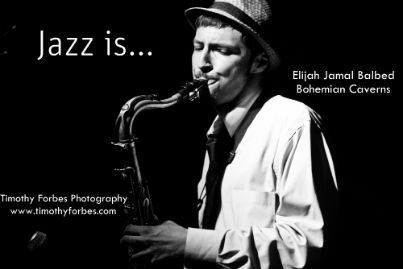 What is jazz to you? Comment below or join the conversation on Facebook.